Rep. Rosemary Brown (R-Monroe/Pike) was joined by East Stroudsburg University’s Upward Bound Director Uriel Trujilo (pictured right), and Joseph Tudda (pictured left), a junior at East Stroudsburg High School North, to testify before the House Education Committee meeting on Monday in support of Brown’s financial literacy efforts. HARRISBURG – In continuing her efforts to focus on the importance of financial literacy, Rep. Rosemary M. Brown (R-Monroe/Pike) recently testified before the House Education Committee to require financial literacy coursework as a high school graduation requirement in Pennsylvania’s public schools. 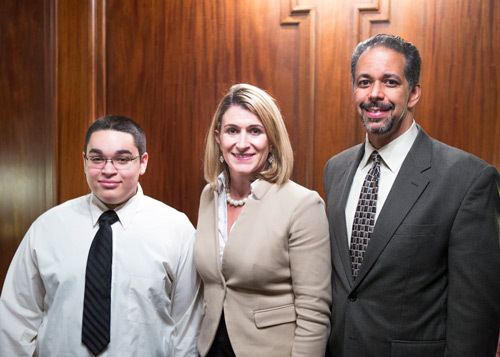 Brown testified before the House Education Committee meeting on Monday with East Stroudsburg University’s Upward Bound Director Uriel Trujilo, and Joseph Tudda, a junior at East Stroudsburg High School North. Brown has spearheaded the financial literacy initiative as co-chair of the Life Skills 101 section of the House Majority Policy Committee’s “Beyond Poverty” initiative. She hosted two financial literacy seminars in the 189th District earlier this year for area high school juniors and seniors. Video from Monday’s hearing is available here. For more information about Brown’s financial literacy efforts, or any state-related issue, contact her district office in East Stroudsburg located at 696 Seven Bridge Road, Suite 101, East Stroudsburg, by calling 570-420-8301. Information on current legislation can also be found on RepBrown.com and Facebook.com/RepBrown.